HOW MANY BLESSINGS HAVE YOU SACRIFICE , BECAUSE OF DISOBEDIENCE ? So Samuel said: “Has the Lord as great delight in burnt offerings and sacrifices, As in obeying the voice of the Lord ? Behold, TO OBEY IS BETTER THAN SACRIFICE, And to heed than the fat of rams. For rebellion is as the sin of witchcraft, And stubbornness is as iniquity and idolatry. Because you have rejected the word of the Lord , He also has rejected you from being king.”(1 Samuel 15:22‭-‬23 NKJV). Answer: Obedience to God proves our love for Him (1 John 5:2-3), demonstrates our faithfulness to Him (1 John 2:3-6), glorifies Him in the world (1 Peter 2:12), and opens avenues of blessing for us (John 13:17). When we obey the Lord, we can live a life of joy, without shame, rooted deeply in the Lord and confident in our eternal hope. “Where the Spirit of the Lord is, there is freedom” (2 Corinthians 3:17). Our obedience is actually part of our assurance that we truly know God (1 John 2:3). When God’s children obey their Heavenly Father, He is glorified. Jesus told us that the plan is for others to “see your good deeds and glorify your Father in heaven” (Matthew 5:16). Of course, performing “good deeds” requires obedience to the One who calls us to good deeds. A Christian’s testimony of holiness is a strong witness that God is at work in the world. “Blessed are all who fear the LORD, who walk in obedience to him” (Psalm 128:1). 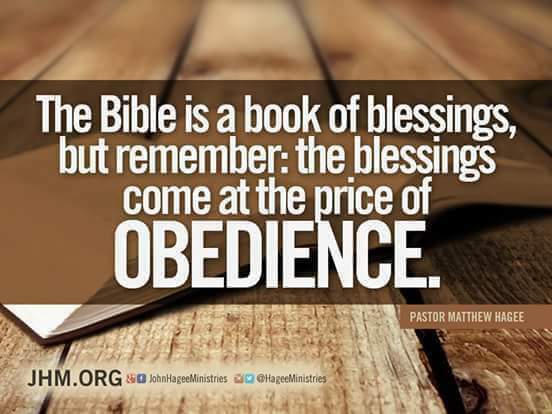 The Bible often tells us that God blesses and rewards obedience. James 1:22-25 says, “Do not merely listen to the word, and so deceive yourselves. Do what it says. . . . Whoever looks intently into the perfect law that gives freedom, and continues in it—not forgetting what they have heard, but doing it—they will be blessed in what they do.” See also Psalm 119:1-2. +Obedience is evidence of Love, Faith, Maturity, and Godly Wisdom. +Our level of Obedience, Love, Faith, Maturity, and Godly Wisdom determines the amount of blessings that are manifested in our lives. +The more we mature in the things of God the greater the blessings of God will manifest in our lives. +Let us all be determined to increase our MATURITY LEVEL in the things of God by consistently walking in Obedience, Love, Faith, Maturity, and Godly Wisdom. Amen!!! This entry was posted in Daily Message and tagged to obey is better than sacrifice.